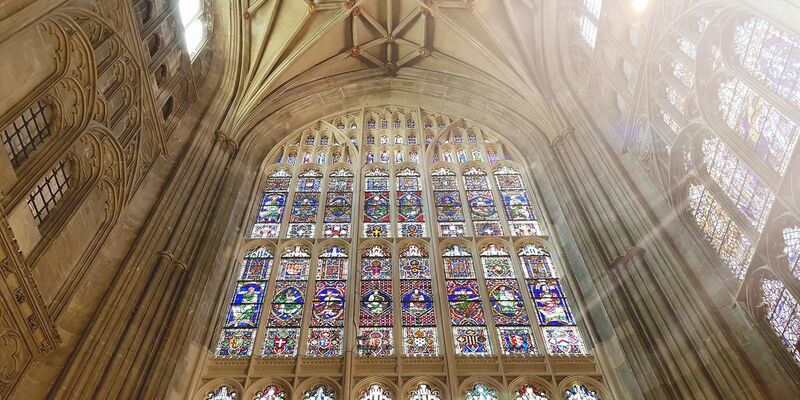 The skills of the team who worked to rebuild the largest stained glass window at Canterbury Cathedral have won national recognition for the unique restoration project. The work of the Canterbury team on the Cathedral’s Great South Window carried off top honours in one of the categories at the Natural Stone Awards – a biennial celebration of the best natural stone construction projects across the UK. At a ceremony in London on Friday (7 December) Canterbury was announced as joint winner with York Minster of the Special Cathedrals (Fellowship) Award sponsored by the Worshipful Company of Masons and Cathedral stonemasons Emlyn Harris and Benn Swinfield were there to pick up the award. The window had to be painstakingly rebuilt after a piece of stone fell from the structure in June 2009. This led Cathedral experts to uncover a number of problems with the 16.7 metre high structure, parts of which dated back to the 15th century, and a challenging conservation journey began. The panels, containing the stained glass depicting figures known as the Ancestors of Christ, were carefully removed – some going on tour to the USA – and then the structure dismantled with each stone being measured and recorded so that exact replicas could be carved in French limestone like the original.. The £2.5 million rebuild was funded by benefactors through the Cathedral Trust and was completed in 2016 when it was blessed by the Archbishop of Canterbury during a special service. Also at the awards ceremony was Jo Deeming, who is the Cathedral’s Surveyor to the Fabric and also a partner at Purcell architects. He oversaw the project’s research and development programme and co-ordinated the broader design team’s technical design work. The original medieval designs were subtly altered to permit the structure more structural flexibility and to facilitate future maintenance and repair whilst ensuring these interventions are unnoticeable from ground level.